St. Martin's Press, 9780312658953, 261pp. "Known as much for her youthful looks and natural chic as she is for her sunny and heartfelt songs, Sheryl has written a cookbook that is true to her style"
Rock star. Activist. Mother of two. How does Sheryl Crow have time to keep so healthy and fit? Sheryl knows how to eat right and deliciously thanks to personal chef Chuck White, affectionately known as "Chef Chuck." The duo met while Sheryl was battling breast cancer, which for her, was a wake-up call to eat better. Since then, Chuck has taught Sheryl how to do just that by cooking foods that are seasonal, locally grown, and vitamin-rich to keep her on top of her game and always ready to perform. This wholesome approach to every dish has been successfully integrated into all aspects of Sheryl's busy life from dinner parties, to touring, to settling in at home near Nashville, TN with her two sons, Wyatt and Levi. 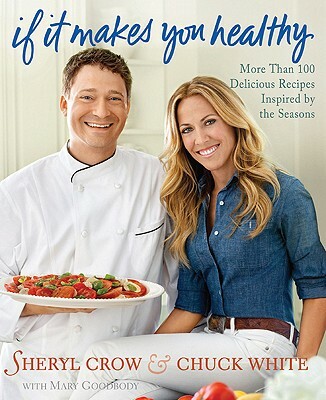 Now Sheryl and Chuck want to bring their nutritious, delicious creations from her kitchen into yours. Rock-and-roll flavored throughout, "If It Makes You Healthy "will have a full menu of approximately 125 recipes grouped seasonally, which reflects Sheryl's busy schedule: Summer months offer tomatoes and corn, and summer also puts Sheryl on the road. Fall and winter brings apples and winter squash, when Sheryl is at home and in the studio. From the big entertaining menus that are prepared for her crew while touring (Mojito braised pork) to small home-cooked meals for Sheryl and her children (basil and apple marinated chicken) all lushly photographed by Victoria Pearson this book will be filled with easy and flavorful recipes anyone can make. Along the way, Sheryl opens up about touring and home life with stories about her childhood, her early years as a backup singer, and her eventual stardom. SHERYL CROW is an accomplished singer-songwriter and musician who has won nine Grammy awards and sold more than 31 million albums. She has performed with the Rolling Stones and has sung duets with Mick Jagger, Michael Jackson, Eric Clapton, Sting, and countless others. She and her two sons live outside Nashville, Tennessee.CHUCK WHITE is a professionally trained chef who has worked in some of the country's most acclaimed restaurants including the Hermitage Hotel in Nashville, The Little Nell in Aspen, and Splendido in Beaver Creek. Chuck has cooked for several high-profile clients and has been working exclusively with Sheryl Crow since 2006, both at home and on tour. "The popular singer joins forces with her personal chef to share nutritious, seasonal dishes. Crow remembers the delicious “Midwestern fare” her mother served when she was growing up, but as a busy, successful artist, her diet consisted of dressing-room junk food and room service. A breast cancer diagnosis in 2006 became the life-altering “game-changer” that spurred her to adopt a diet rich in sustainable, organic foods. Joined by her longtime personal chef Chuck White, the cookbook’s multifaceted recipe sections are grouped by seasons: Items like stuffed avocados, Southern Cobb Salad, Pecan-Crusted Trout and Lemon-Vanilla Panna Cotta are spring and summer tour favorites, while winter months spent in the studio feature Warm Hummus Soup, Barley and Vegetable Risotto, Five-Spiced Pork Tenderloin and her Mom’s Reconstructed Chili. Many of the recipes are supplemented by Crow and White’s smart, appealing cooking and food recommendations (ceviche, country ham, quinoa), along with quick factoids on everything from wasabi to grass-fed beef from Crow’s former dietitian Rachel Beller. Crow doesn’t deny herself the “10 percent cheat zone” and guiltlessly indulges in desserts like Vegan Chocolate-Mint Brownies and Banana Bread Pudding. Each section is clear and well organized, accented by generous photographs of the finished products and of Crow in the kitchen, on the road and alongside her two adopted sons. Brimming with easy, nourishing recipes, food tips and personal anecdotes, Crow’s recipe book should garner new appreciation from fans, foodies and cancer survivors."